Collagenous colitis (CC) is characterised by a band-like collagenous deposit under the surface epithelium of the colorectal mucosa. Chronic watery diarrhoea is the main clinical symptom. Lindstrom (1976) recorded the first description of this previously unrecognised entity and coined the term ‘collagenous colitis’. Since 1980, over 100 cases of CC have been reported in the literature, mostly as individual case reports. Two large series of 17 and 21 cases respectively have been published recently (Wang et al. 1987; Widgren et al. 1988). There have also been a few reviews and editorials on CC (Bogomoletz 1983; Anonymous 1986; Williams and Rhodes 1987; Rams et al. 1987). 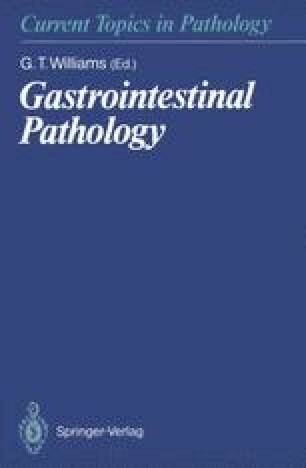 In addition to published cases, a substantial number of unpublished cases of CC have been observed and diagnosed by pathologists throughout the world. This review on the different clinicopathological aspects of CC is based on our own experience of about 30 cases referred for consultation and data from the literature.